Growing up, my mom always loved animals so I’ve grown up with pretty much everything imaginable from dogs, goats, cats, tortoises, lizards, snakes, fish, ferrets, rats- we don’t really discriminate in my household. Me, I love dogs more than anything but I became the resident crazy bird lady. 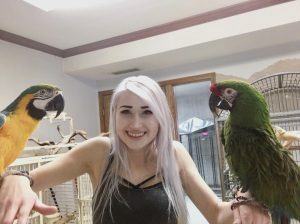 I have two Amazon parrots, Scout and Hawkeye, and a small flock of chicken nuggets as I call them: Archimedes the parrotlet, Tico, Derpy and Derplet the lovebirds, and Lyle the parakeet, most of which are rescues or have been dumped. My mother and I also have two rescue macaws- Harley the military macaw and Lulu the Blue and Gold. I feel far too often anything less than a cat isn’t really taken seriously, especially when ill. I strongly believe that a mouse, a bird or any small animal deserves the same care and treatment any animal should get when it’s sick. No life, no matter how small, should be disposable.